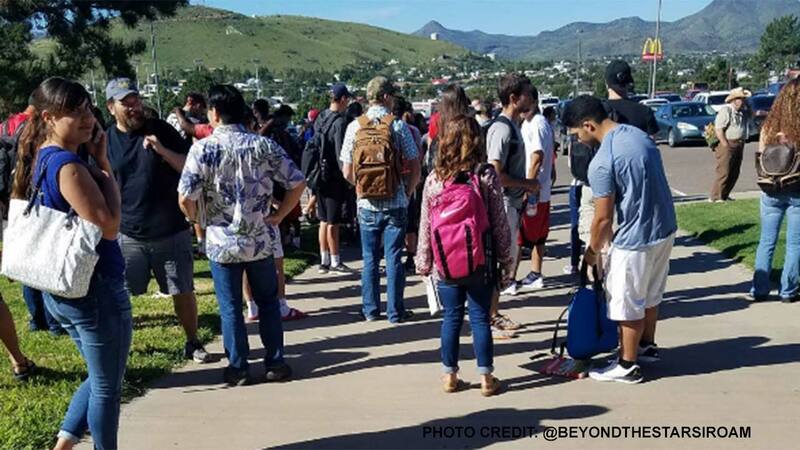 ALPINE, TX -- A female student died of an apparent self-inflicted gunshot wound Thursday after shooting and injuring another female student inside a high school in West Texas, according to the local sheriff. JUST IN: Shooter dead, 1 student shot at Alpine High School in Brewster County, Texas, police say. "The shooter appears to have shot herself," Brewster County Sheriff Ronny Dodson told radio station KVLF. A gun was found near the suspected shooter, he said. The incident began shortly before 9 a.m. at Alpine High School in the town of 5,900 in Texas' Big Bend region. Authorities did not immediately release a possible motive for the gunfire. Dodson said the injured student ran outside seeking help and was taken to a hospital with injuries that weren't considered life threatening. He said a federal law enforcement officer who was responding to the incident was shot in the leg when another officer's gun accidentally discharged. The shooting prompted a lockdown at Alpine's three public schools. Dodson said the shooting at the high school was part of a chaotic series of events that included a bomb threat called in at nearby Sul Ross State University, which required law enforcement personnel to rush there from the high school. "That's ridiculous for someone to call in something like this when we've got this situation going on," Dodson said. "This community does not expect this, we don't want this, and we can't explain it yet." Alpine is 220 miles southeast of El Paso and 110 miles north of Big Bend National Park.